Most of us are still recovering from the frenzy that was this year’s Black Friday shopping extravaganza, but the same clearly can’t be said for online retailers gearing themselves up for Cyber Monday. The Monday after the Thanksgiving holiday is always a great time for consumers to grab some deals through various online retailers, with T-Mobile putting up a great offer for those looking to upgrade their current iPhone situation. 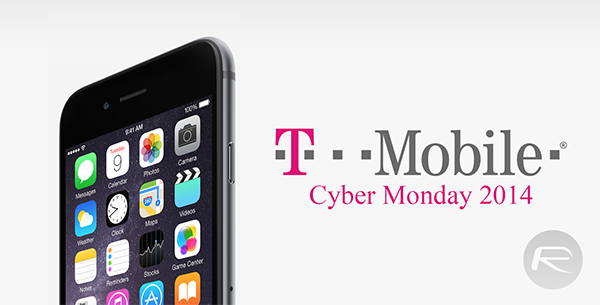 So what exactly is T-Mobile offering to consumers on Cyber Monday? First of all, the network is offering a free-of-charge higher capacity upgrade to those interesting in purchasing one of Apple’s fantastic iPhone 6 smartphones. The entry-level 16GB variant of the device always looks like an attractive purchase as a method of saving money, but in reality it rarely offers enough storage for most of us who regularly capture videos and photos or store music directly on the device. T-Mobile is allowing consumers to pick up a 64GB model iPhone 6 for the same price as the 16GB version, which represents a $100 saving straight away. In an attempt to try and sweeten the deal for individuals who may not be looking to get Apple’s latest smartphone, T-Mobile is also extending the offer to cover earlier models of the iPhone. The free capacity upgrade is also available on the 4-inch iPhone 5s and 5c models allowing users to grab a 64GB iPhone 5s for the price of a 32GB version and a 32GB iPhone 5c for the price of an 8GB model. You really can’t turn your noses up at those kind of savings if you’re in the market for a new iPhone. The deals being offered by T-Mobile are appealing enough, but it’s the whole package that should really make the offering an attractive one. In addition to the great savings, a purchased iPhone 6 on T-Mobile also supports the company’s Wi-Fi calling service and also offers a deposit fee discount for anyone who also wants to grab its Personal Cellspot router to use the calling feature. As with all Cyber Monday specific deals, the newly released T-Mobile offerings are only available to pick up during today, can only be purchased and activated through the T-Mobile website and can only be offered for as a long as stock is available. Y’know, a link to T-Mobile website ANYWHERE in this article would be nice. I notice that you guys are not very big on linking to your source. T-Mobile is bad but nice offer, thought. I don’t understand the T-Mobile hate, I love them for the price. This is a great deal. I already own a 64GB iPhone 6, but I just bought my wife and daughter one today. And with the Taig jailbreak for 8.1.1, it’s going to rock.